Represent on Rare Disease Day 28 FEB 2018! WHAT IS RARE DISEASE DAY AND WHY? WHAT? WHY? WHO? WHERE? WHEN? It's that time of year again, when sufferers of rare diseases worldwide come together to raise awareness throughout the world. This annual event is intended to call the attention of politicians who can create laws and modify laws to make it possible for persons with rare diseases to get treatment sooner than later. It also calls the attention of National Institutes of Health systems of many countries around the world by raising awareness to the fact that there is a great need for research grants in order to be able to carry out research into rare diseases, including TMAU and other yet-to-be-discovered uncontrollable odor conditions. Each sufferer around the world can participate in whatever capacity he or she would like, or in as many events as possible. Below are a few of ways you can contribute to this very much needed cause. Rare Disease Day 2018 Virtual Race! Tell your story for Rare Disease Day 2018! Click on Icon to tell your story! Every year, sufferers from our community volunteer to tell their story of what it is like to live with an uncontrollable odor condition. Raising Awareness is a MUST for our community. Otherwise, society at large simply things that the odor is the result of poor grooming. This ignorance tends to enrage those who do not understand that a sufferers goes to great lengths to try to not offend, and thus, they end up behaving like bullies towards sufferers. By telling your story in your own language, you can raise awareness to educate the public. You can write your story, post your photos, or do a video! Browse through the '7 WAYS TO PARTICIPATE IN RARE DISEASE DAY 2018' page to get ideas of what fits best for you to join in! These activities can be done anywhere in the world in any language. 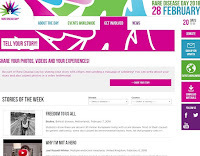 Just take a look at the Rare Disease Day Events Worldwide! So far, there are 193 events in 63 countries scheduled. So please, get involved by joining Akiya in supporting her new directorship position in MEBO and/or by posting your event! Check out MEBO's involvement in Rare Disease Day throughout the years (scroll down to see all posts and click on "Older Posts" at the bottom of the page).